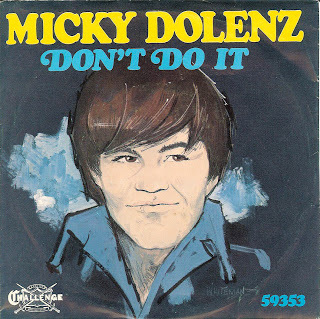 Colgems Records: Micky, "Don't Do It"
With Micky's new release, "Remember," out now, it might be time to look back at his other solo recordings, including the only one that actually made the Billboard Hot 100 singles chart. For a full appreciation of this tune, please go to http://rantingravingblog.blogspot.com/. It isn't a Colgems record, but it does bear worth mentioning. "Challenge" was Gene Autry's label,BTW,and its flip "Plastic Symphony III" was used in several Monkees Episodes,as you no doubt also know.Micky Also had "Huff Puff" too for them. Yes, all good points. And it shows just how popular the Monkees were that this single actually charted on the Hot 100.